Today's challenge is brought to you by the wonderfully talented Rho Densmore, CZT. You may remember her from this challenge when we all used her tangle Fiore di Pietro in honour of her late brother in law. She was kind enough to volunteer a challenge while my family and i are in Philadelphia for a medical conference for Artoo's condition, Moebius Syndrome. So, no pictures of the fam this week - as we are LIKELY touring Philly in a double decker bus today, and then we're all gonna run up the steps like in the movie Rocky. well, i might walk up the steps, then run up the last five. lol. I'm gonna eat me a philly cheesteak and then possibly find some cream cheese. ;) and maybe if i run into Mac, Dennis, Dee, Charlie, and Frank at Paddy's Pub - that'd be cool too. “The most important thing is not to win but to take part!" In other words, the outcome is not as important as participating in the process. It is the act of being involved that is the greatest victory of all; pushing beyond our personal boundaries, reaching outside our comfort zone, striving to do our best. The results become the “icing on the cake” for our personal journey along the way. It is this same message that is at the heart of Zentangle, the outcome is not as important as the process. It is the journey each one of us takes one stroke at a time, every time we take our pen and put it to paper. What better way to honor the heart of both endeavors that to have an Olympic inspired Diva Challenge less than a month away from the 2012 Olympic Games in London? 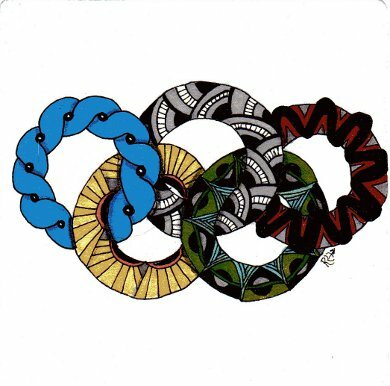 The Olympic Ring emblem was also created by Pierre de Coubertin in 1984 and the intention of his design was to be representative of the five inhabited continents of the world which at that time had chosen to participate in the Olympic spirit of healthy competition. The five interlocking rings colored, blue, black, red, yellow, green, and white background are colors in which at least one appears every national flag at this time. Preparing this Diva Challenge was indeed a challenge for me as I am not at all comfortable with drawing circles, yet! However, a challenge is for the very purpose of doing your best regardless of the outcome. My two examples below are just that. Rho Densmore is currently the President and Coach for her small, but growing archery company The Second Arrow. 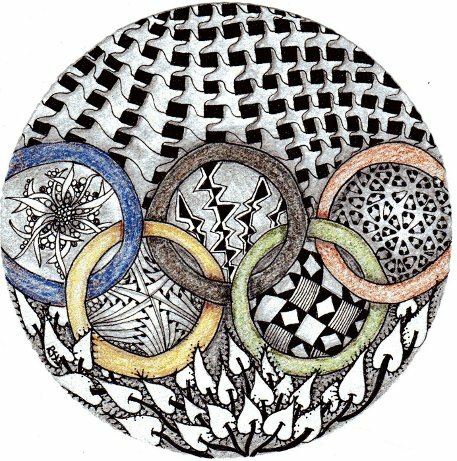 She was first introduced to Zentangle while she was on vacation at La Romita School of Art in Terni Italy, last October. Instantly she was addicted to this newfound method of creativity. 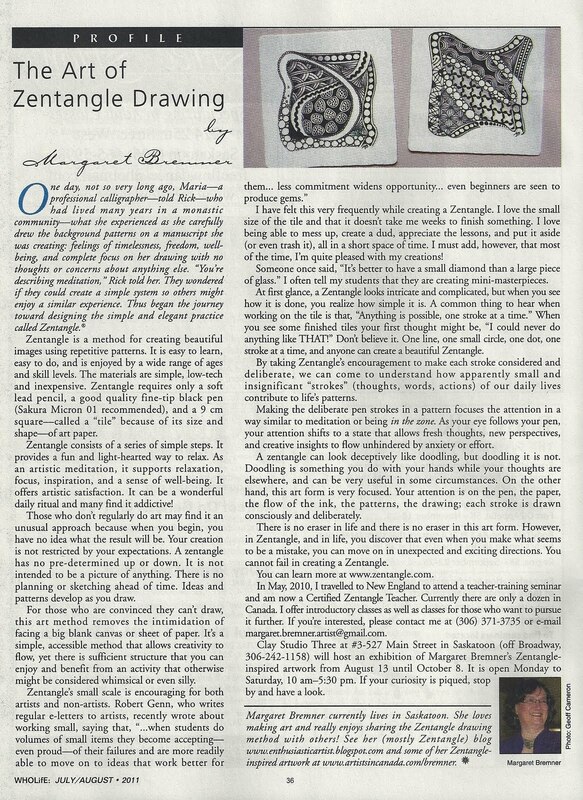 In fact, many late nights were spent in the schools chapel/studio as she scoured the internet for any and all Zentangle information to be found. Once back in California she set out to become a CZT and participated in the CZT class #8. She is now working to incorporate Zentangle into her archery business with the additional intention to help her students gain better focus and relaxation skills through the process of creating Zentangles. Currently Rho and her husband Jim live in the San Diego area with their 4 cats, KJ, Kami, Kindle, and Koda. Sue, click the button and go to the Fascination page. Scroll down to the post from July 15 (I think. It said "yesterday".) There are four steps listed under "To Vote" Hope it works; I haven't actually tried it yet! Thanks Margaret, I'll try that tonight. It worked Margaret - thanks. I think there were different instructions (or maybe I was looking in the wrong place) this morning. It's pretty straight forward. I'm not sure I shouldn't have done something more with the circles. I may try this again and decorate the circles. Great idea this time as usual!! Thanks for keeping going!! Rho, this was the hardest challenge yet and yes, that is a good thing because it makes me really work at it. Now once the idea has come the tangling is still zen so that too is a wonderful challenge. Your tiles are absolutely amazing! I hope the conference went well Laura, and thanks for having a guest to fill our challenge needs! awesome challenge rho. have a feeling this one will be a little difficult, but I'm gonna do it! I'm kind of glad to see other people saying this is a difficult challenge as I felt the same but put it down to me being a newbie. Now I've posted my entry I'm going to look at everyone else's because I know they'll be fabulous! I had trouble at forst getting the intertwining of the rings correct. I did enjoy though, picking the patterns to go in and around each ring. Then i used a new product(for me). Prismacolor Art Sticks. I had bought them years ago when I made the mistake of thinking they were Nupastels for a pastel project. So I opened them last night thinking they were colored pencils. Wrong again! I think they must be like crayons, but I am still not sure. I was going to try to do Leenns method with layers of pencil to make nice soft colors, That didn't happen! Thanks for the fun challenge Rho. I'm sorry I wasn't able to do a tile for you but I would be happy to do one now that I'm back if you still could use one. Great challenge, Rho! Your work is beautiful! Beaut challenge Rho for focus and concentration! Hi again everyone, I had this idea for the challenge and proposed it to Laura before I ever attempted it. Honestly, I made several tiles and Zendalas before I finally submitted the two that I did to Laura. Also, I once again wanted to thank everyone who participated in the Fiore di Pietro challenge (and even if you didn't I still appreciate your kind words and thought for my family.) I will be receiveing the first copy of the book this week. If it turns out well we will then order the rest and present them to the family at the end of the month. Thanks for a fun challenge Rho! Enjoy your time in Philly Laura! I hope its ok the way I posted this week. I got behind and have about the last 5 challenges in one blog post but the most recent is at the top and the first pic you see. If my entry gets removed I'll understand and get back on track next week. Thanks Rho for filling in, great (but difficult) challenge. Your tiles were inspiration for me. And, Laura, I hope you are having a wonderful time in Philly. Thank you for this challenge. I think there are some wonderful entries this week, quite inspirational. I love this challenge!! I am such a big Olympics fan, this was so much fun!!!! I hope you and your family are enjoying yourselves. I went to Philly when I was in middle/junior high school. Hershey Park and the Liberty Bell was awesome. Rho thanks for such a wonderful challenge. I forced myself to use some new tangles I hadn't tried before. I love what I came up with. Great challenge! I enjoyed this one. Your examples are great, Rho! Great challenge. Sorry to be so late to the party! I'm probably too late this week!